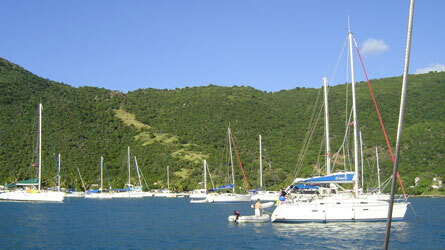 We arrived in Great Harbor on Dec 29 after a wonderful two and a half hour sail from St John. Did you catch that!! SAIL! Finally I have reached the turning point where most destinations are North or South. With the winds predominantly from the East in the Caribbean, Solace has been beating into wind and waves since we left Ft Lauderdale. 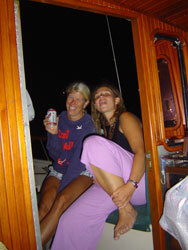 We arrived a few days early because I had heard from some friends on "Seahorse", Tracy and Pat who where already there, that the harbor got crowded. We threw out 150 ft of chain and a 45 lb. cqr and dragged it 3/4 of the way across the harbor before it caught. Sand and Silt over coral is not great holding. "Do you have any weapons, including spear guns & jet skis? ", asked the customs officer. Well that would explain why I haven't seen any pocket rockets (jet skis) since entering the VIs, they are considered weapons. What an enlightened way of thinking.. Ha! Miami would benefit from such a philosophy. Oh, did I mention that Magic Mushrooms are legal and sold at a little beachside stand. 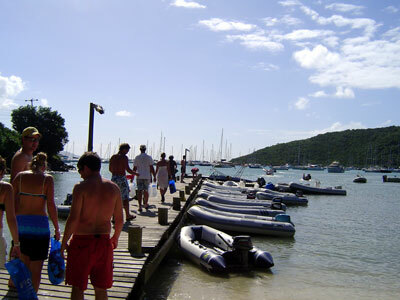 Jost Van Dyke is 3 miles by 1 mile wide, has a permanent population of 200 people and one road cut into the hills of the south coast.. Great Harbor is surrounded by steep hills & coral heads that meet at a neat beach about a quarter mile wide. You can find a small grocery store, the customs building, a T-shirt Shop, and 4 open air bar/restaurants including the famous Foxies. Rumor has it that Foxy was born and raised on Jost Van Dyke and at an early age would entertain locals and visitors with sassy reggae on a beat up guitar. In his mid teens he went to St Thomas to further his musical career...but couldn't get a gig. 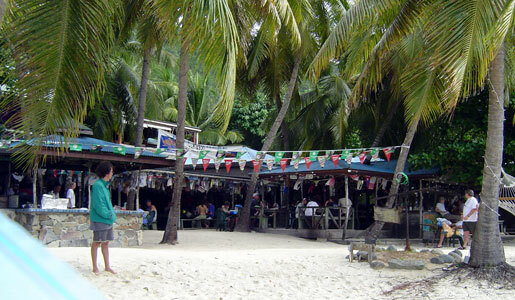 In frustration, he returned to Jost and started a little tiki bar on the beach so that he would have a place to play. That little establishment can now hold 500 people, has its own beer brand and is famous worldwide for it's New Year's bashes. It is also famous for a delicious rum drink called the "Painkiller", which Isaac and I sampled before heading back to the boat. By the afternoon of the 30th there was already 100 boats anchored in the harbor and spirits where high. 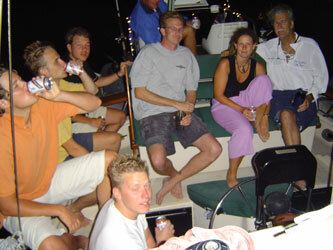 We decided to have a little party on Solace that evening with some newly met friends including the Holland Drinking team, six young men who had traveled halfway around the world to stuff themselves into a little 36 ft Benetou chartered out of Tortola. We ended up having 24 people show up for the festivities, the most people I've had on Solace and I was happy to see that we had plenty of room. As we swapped stories late into the evening, boats continued to arrive. Let me take a moment to talk about bareboat charterers. 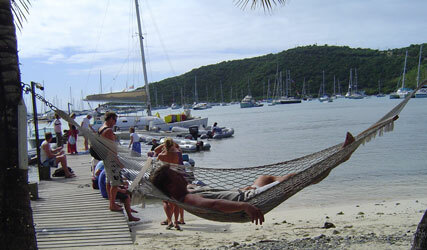 They are not cruisers and most have spent a limited amount of time on boats and yachts. This becomes apparent in when you observe them doing some of the most basic things, specifically anchoring. Anchoring is an artform and dragging (as you have read in some of our previous articles) is a cruisers biggest nighmare. The proper steps for anchoring as explained in Dutton's are: 1) approach downwind to your anchoring point a let out a scope of no less than 6 to 1 to depth, 2) back down at 1200 rpms until the anchor catches sufficiently to prevent further movement of the vessel, 3) dive down and visually check the anchor set. ...not: 1) wedge yourselft into a group of boats, 2) drop 50 ft of rope and a small danforth, 3) head to shore for a painkiller. As the wind started to howl through the bay, I knew we where in for an interesting night. True to form, by morning, Solace had a 50 ft Motoryacht rafted on one side and a 45 ft Catamaran on the other. Both had dragged across my anchor chain and caught fast. We had no choice but tie them up to Solace until the anchors could be untangled in the morning. I must note that Solace's one cqr held all three boats secure throughout the night. This became a common sight through New Years. Incredibly, no boats ended up on reef or rocks, another testament to how boaters help each other in times of need. On the 31st, the ferries from other islands started arriving and unloading Celebrants, over 3000 by midafternoon. Tracy, who was here last year, informed me that the ferries stopped running at 11:PM and did not return until 9: in the morning. Over 150 boats where anchored in Great Harbor alone, adding another 800 people to the party. With speakers turned up so loud that they buzzed with the bass players frantic licks, Foxy whipped the crowd into a frenzy with his Reggae-Blues rythms. He has certainly gotten better over the years and is extremely entertaining. I could swear that over 6 hours, he only took two 15 minute breaks. 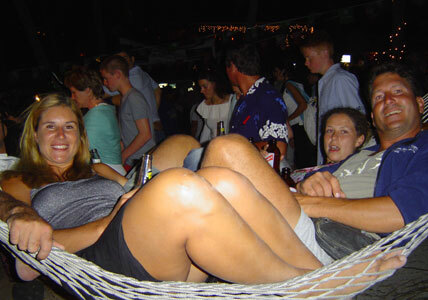 Sometime before 12, I noticed the single hammock between Foxys and the beach had been vacated. I quickly claimed this prime real estate. We jammed 10 people into the hammock and as the air pulsated with music and laughter, we rocked our way into a new year of adventure and learning. Trying to steer the dingy in a straight line back to Solace at 4 in the morning, some rather foolhardy person decided to shoot a red flare into the air. Looking back, I was reminded of the first 15 minutes of "Saving Private Ryan". The beach was strewn with bodies, some half in and half out of the water. Shadowy figures staggered among the palm trees or huddled together in groups at the periphery of our vision. Isaac and I agreed that it was one of the best parties we have ever been too.